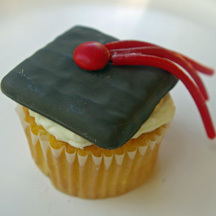 You can make dozens of graduation party cupcakes quickly with just chocolate-covered graham crackers (mortarboard), licorice ropes (tassel) and M&M! What You Need: 1 cupcake; white or off-white frosting; 1 chocolate-covered graham cracker; red licorice ropes (such as Twizzlers Pull-N-Peel); 1 red M&M. How to Make It: Frost cupcake. Use dab of frosting to attach M&M to center of cap. Cut three lengths of licorice and use tiny dabs of licorice to attach to cap, from centered M&M outward. This entry was posted on Monday, May 11th, 2009 at 4:01 pm	and is filed under graduation cupcakes. You can follow any responses to this entry through the RSS 2.0 feed. Responses are currently closed, but you can trackback from your own site.